If you are a wilderness explorer or gardener, an entrenching tool is a must inclusion in your curriculum. They are light weighted, compact and major survival tool that can be carried along without any hassle. There are many benefits of using an entrenching tool and it can be used to dig a trench, sanitation hole or ditch or helps in clearing spot for pitching a tent. It is small and can be easily stuck or carried along with your luggage. So, if you are looking for a perfect camping and wilderness tool, read the comprehensive guide to find the best entrenching tool. They can be used as self-defense tool also in alarming situations as some blades are serrated and help in cutting through. Choosing the best one is difficult but this guide will help you make the right choice. 1 Why Are The Entrenching Tools Used? Why Are The Entrenching Tools Used? It is considered to be one of the essential survival tools and is used in many situations. If you love going outdoors, consider purchasing one right away. Here are some of the benefits of including the entrenching tool in your survival kit. It helps in building a temporary shelter or pitching a tent. The shovel can be used for digging and pitching tents accordingly. It helps in digging sanitation holes while you are in the wilderness. A folding shovel can be used for digging trench or hole for use as washrooms. Fire is an essential requirement during outdoor adventures. It helps in digging a pit for setting up fire cooking, keeping warm and keeping wild animals away. It can be used as mini axe which can be used as saw, cutter, and chopper. It helps in chopping and cutting of firewood and food. The sharp or serrated edges of the tool make a great self-defense tool and come handy while fighting predators. 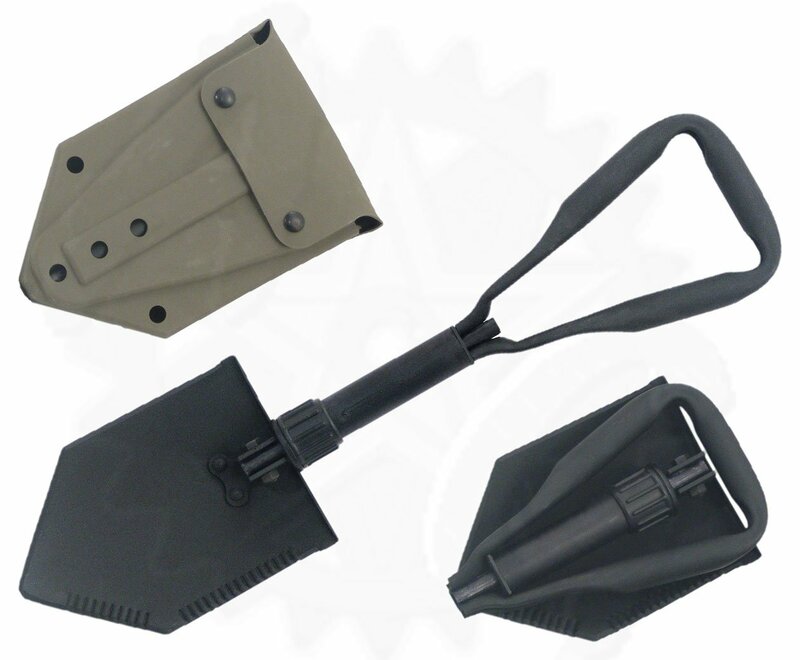 There are many features and things you must consider before purchasing the entrenching tool. A good shovel must have certain characteristics in them. Do check for the following before making the purchase. Material – It is important to check the sturdiness and blade material and ensure that the blade does not bend too much. The blades made of high carbon steel or stainless steel is the best and most of them are coated with black powder making the tool corrosion resistant. The tool with metal handle is much stronger and sturdy. Portability – The tools with tri-fold design are best as they conveniently fold on self and are convenient to carry along. The tools are available either in three-piece folding or two-piece folding mechanism. The former one is more preferred as it is smaller in size and better to carry. Blades – The more the blades are versatile, more is the utility of the tool. It is better to purchase a tool which has chopping, sawing, digging and cutting capability. Blades with both serrated edge and teeth are better. It is original and genuine US military issue entrenching tool that is compact, light in weight and foldable. It boasts of its tri-fold design which collapses and makes the tool highly portable. It is constructed of high carbon steel that gives it its toughness and durability and does not break even after prolonged usage. The foldable tri-axial design makes it a great utility tool for camping and exploration. It is integrated with sharpened axe edge along with serrated saw edge for better utility. The body of the tool is coated with powder coat finish. It is a heavy duty tool made of high carbon steel that gives it maximum durability and toughness. It has an aluminum handle. The tool is finished and coated with black powder. It is a tri-fold design that is easily collapsible making it easy for storage and portable. It includes both sharpened axe and serrated saw edge. 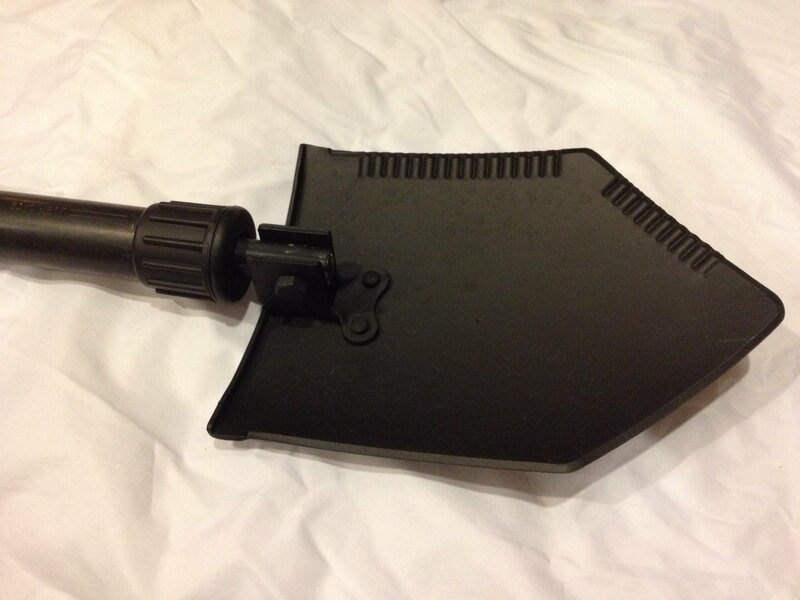 The quality of the entrenching tool is exceptionally great and has threaded handle locks blade in two positions. One of the major cons is the finishing with black powder coating tend to chip off with time. No additional features apart from digging. It is genuine and original military issue entrenching tool that boasts of its strong and sturdy frame through its high carbon steel construction along with aluminum handle. The tool has great finishing as it covered by a smooth coating of black powder. The tool is a tri-fold design which becomes compact by folding on itself and is easy to carry. The folded lightweight and compact tool can be carried in ODG vinyl cover which is included with the tool kit. It requires minimum space for storage and extremely light in weight. The tool has both serrated saw and sharpened axe edge. Tri-fold design with the tool folding on self and on collapsing, it is easy to carry or store. It includes both serrated saw and sharpened axe edge for better utility. It is genuine heavy duty military issue made of high carbon steel that imparts overall strength and has an aluminum handle. The tool is finished with black powder coat for long lasting usage and utility. The black coating on the tool tends to chip off after prolonged use. Functions are strong and sturdy but edges may get blunt over time. It is a robust and sturdy foldable tool which is great for moving particles of sand, snow and dirt. It is easy to carry and highly portable with its compact nature. It is resistant to corrosion through the black coating. The tool is made of high-end steel owing to its robustness. The tempered blade has teeth on one side for cutting while the other end has serrated blade great for slashing. 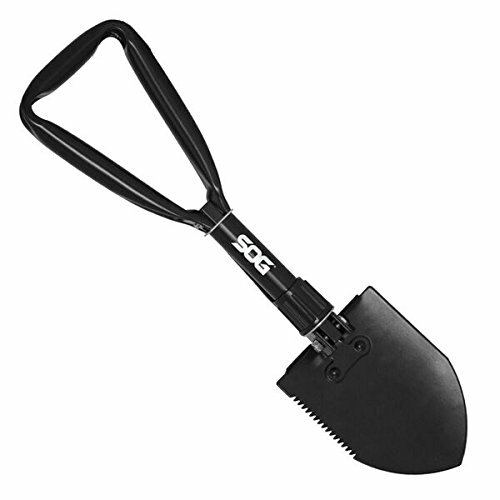 It has a triangular shaped handle that makes the grip of the shovel convenient and easy. It is a great tool for outdoor activities and extremely versatile in its functions. It is sturdy, light in weight and compact tool which is great for multiple outdoor activities. It has tri-fold design that enables folding of the tool and makes it easily portable. The construction is sturdy with the tool made of high-end steel that gives it extreme longevity. The all steel construction is finished with a black powder coat that makes it resistant to corrosion. It has tempered steel blade with serrated jaw on side and teeth on the other side. It is extremely versatile and is great for outdoor use. It is smaller comparatively which might be difficult for beginners to use. Folding and unfolding sometimes is complicated. Now that you know how useful an entrenching tool is, you must have one in your survival kit if you are outdoor enthusiasts. It is a light weighted, small and compact tool which helps in digging trench or pits while in adventures. The foldable attributes of the tool make it extremely convenient for one to carry it along. There are many entrenching tools in the market but not all of them are of great quality and feature. The guide with best entrenching tool is created after individually testing each and every listed tool for their utility. The guide as framed and prepared by experts list out genuine pros and cons of the tools that will help you make the right selection.